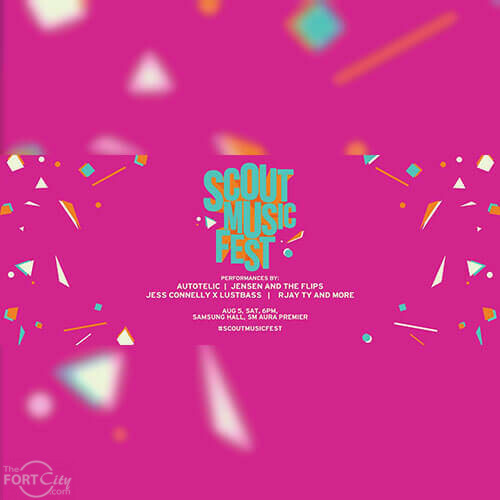 Introducing: the Scout Music Fest, happening at Samsung Hall, SM Aura, this August 5 from 6pm onwards. Listen to your favorite music acts while indulging in a little bit of summer fun. First 500 to buy tickets will get one free drink (for 18 years old and above). Performances by: BP Valenzuela, Autotelic, Jensen and The Flips, IV OF SPADES, Tandems &apos; 91, Tom&apos;s Story, She&apos;s Only Sixteen, Rjay Ty, Oh, Flamingo, jess connelly x LUSTBASS, and Farewell Fair Weather.